Our wonderful host at the Chambre d'Hote (Le Relais des Faisses) reminded us that the causse area we are now walking through was the setting for the sinister event in Ian McEwan's novel "Black Dog". We are also getting into the countryside where La Bete du Gevaudan, a wolf-like monster, killed 100 people, between 1764 and 1767. 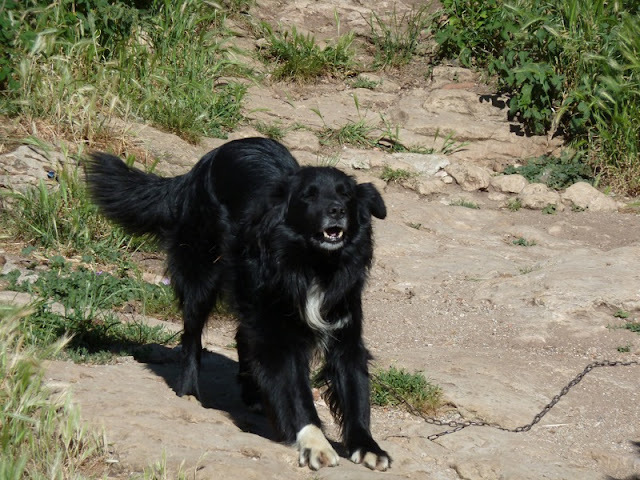 Given that combination I'm not sure what was worst, the first black dog to start barking at us or the exceptionally hairy donkey. Brilliant morning for a walk, bright, cool wind, clear blue sky, perfect fit with the wide open landscape which featured in the first half of the walk. It's much dryer here than the countryside I've been walking through since the Pyrenees and the greens have changed from spring like to high summer. After crossing a high level plain the first village you get to is Saint-Maurice-de-Navacelles which looks nice but with not as many facilities as our stop-over last night. 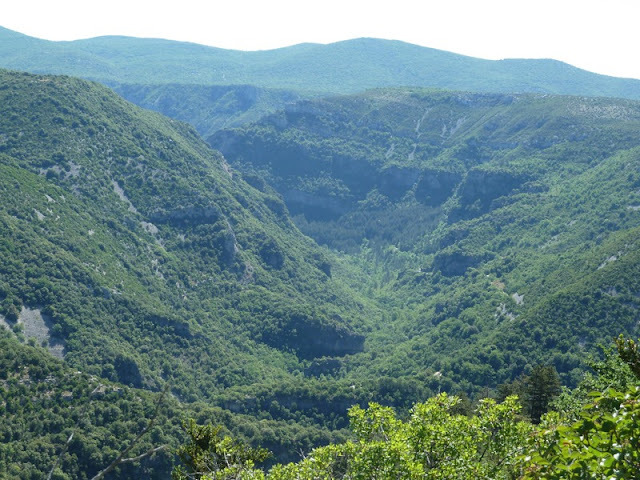 Just after Saint-Maurice-de-Navacelles you drop into the Gorge de la Vis, a great gash across the causse. The walk along the gorge was great, initially a steep descent all the way down to the river and then a gently undulating walk along the side. 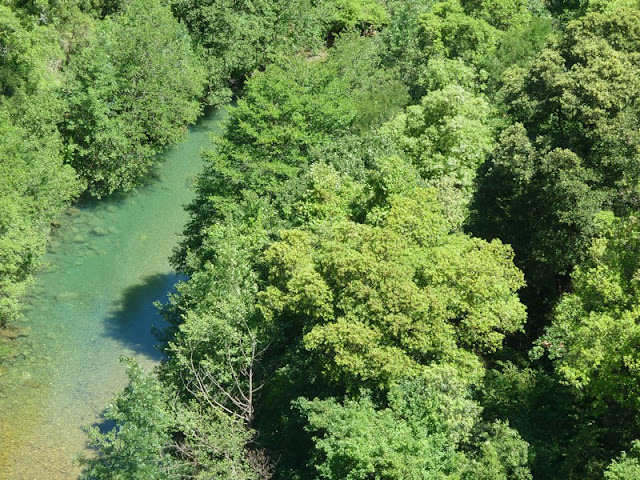 The only frustration was that the river looked very inviting and we had set our minds on a bit of river swimming, but the path stubbornly kept its distance. 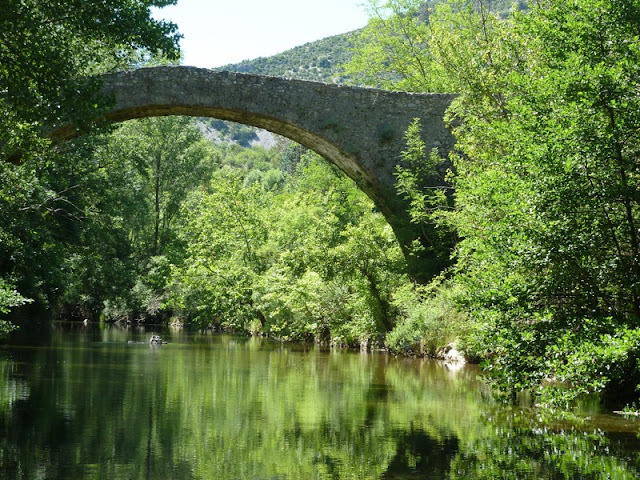 After walking about 20 kilometres we arrived a Navacelles which is a beautiful village complete with crashing waterfalls and a wonderful ancient footbridge. Staying here and spent the afternoon relaxing in the sun and Christine even went for a swim. Much too cold for me but I haven't been acclimatised by swims in the English Channel. 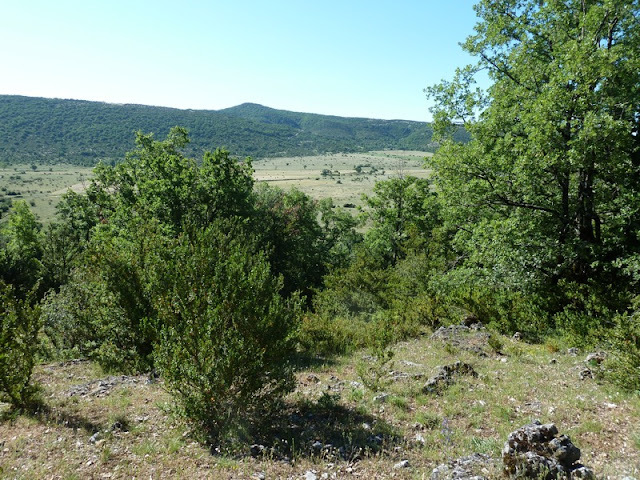 Navacelles is also the location for the Cirque de Navacelles. A neck of a sharpe meander in the river system eventually cut through and the neck formed the waterfalls and the ancient meander the Cirque. The flat bottom of the ancient river bed is now a large U shaped hay meadow and Nacacelles sits inside the U on the island of rock next to the waterfalls. An amazing location it was declared a site of special national significance in 1943. Christine writes: Our base tonight is 'Ammonite', a beautifully restored old house owned by a friendly Dutch family who also run the creperie down the road. Looking forward to salad and omelette tonight. John has just found the key to last night's room in his trouser pocket - our host has volunteered to get it back to it's rightful owner. I'm not an expert on the subject but I have been bitten by quite a few French ticks and had to have blood tests to check for suspected Lymes disease a few years back. It is generally reckoned that the tick has to stay attached for 24 hours in order to infect you with Lymes disease but this is by no means certain. The most common initial symptom of Lymes disease is a red swelling around the site of the bite and this can appear from between 3 days and 6 weeks. Most people who get bitten by ticks don't develop Lymes disease, but if you get a swelling you should rapidly consult a doctor or pharmacist. 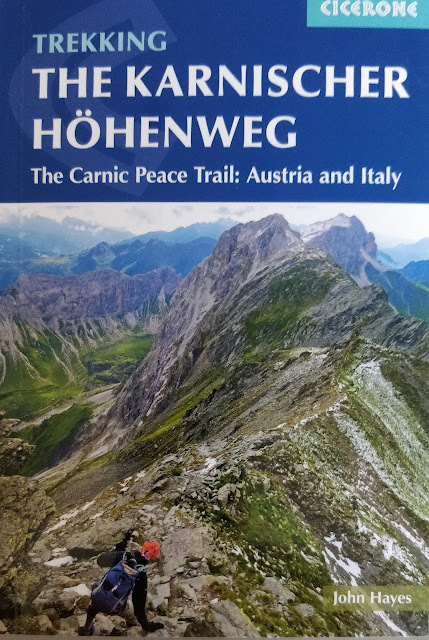 Enjoy the walk tomorow. 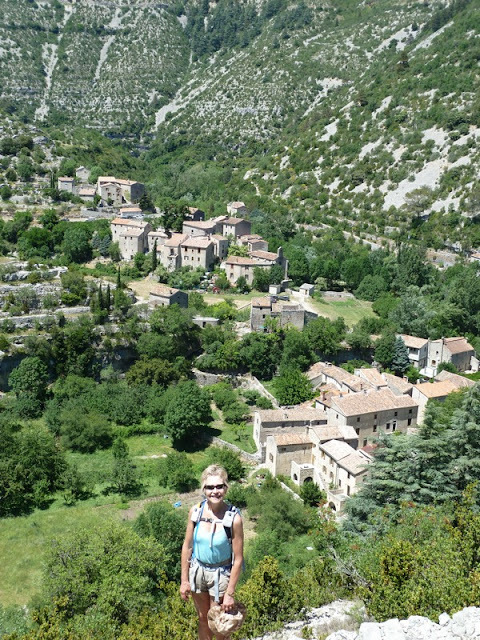 Once out of the gorge you will have another pleasant walk across the causse before dropping down to Le Vigan. If staying at Le Vigan, the ethnographic museum is well worth a visit. Well, there is much more to say about ticks and their dangers than I did to yesterday's blog. For example: Depending on the thickness of your skin, a tick may need something like a whole day to drill through it and get to a vein. But when you remove the tick in an improper way during that first day, it will vomit or spit out the Lyme parasite which, in that case, still may infect you. Of course, this danger is much bigger once the tick has reached your blood, because then it will spit or vomit into your blood stream. There are now special devices for sales in drug stores and pharmacies, which help you to safely remove a tick just preparing to have its meal of blood. Cleaning the spot with alcohol, as Juan advised, after removing the tick, is very wise. But do not drown the tick in alcohol, because, like human beings after consuming too much of it, the tick will vomit whatever it has inside, including the parasite.